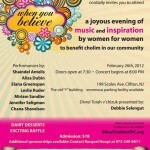 Bikur Cholim of Passaic Clifton invites women and girls to join Shaindel Antelis, Aliza Dubin, Elana Greenspan, Leslie Ruder, Miriam Sandler, Jennifer Seligman and Chana Shavelson for an evening of music, inspiration and plain old fun including dairy desserts, raffle and Divrei Chizuk by Debbie Selingut. Doors open at 7:30. Concert begins at 8.